New Delhi [India], Apr 12 (ANI): A group of retired officers of the Army, Navy and Air Force has written a letter to President Ram Nath Kovind, urging him to urgently direct all political parties to stop using the services to further their political agenda. "We hereby respectfully urge to take all necessary steps to urgently direct all political parties that they must forthwith desist from using the military, military uniform or symbols, and any actions by military formation or personnel, for political purposes or to further their political agendas," the letter said on Thursday. The 156 signatories include eight former service chiefs – General Sunith Francis Rodrigues, Shankar Roy Chowdhury Deepak Kapoor, Admiral Laxminarayan Ramdas, Vishnu Bhagwat, Arun Prakash, Suresh Mehta and Air Chief Marshal NC Suri. The veterans expressed concern over "unusual and completely unacceptable practice of political leaders taking credit for military operations like cross-border strikes, and even going so far as to claim the Armed Forces to be 'Modi ji ki Sena'". Addressing a public rally in Ghaziabad on April 1, Uttar Pradesh Chief Minister Adityanath had referred to the Indian Army as "Modi ji ki sena" while drawing a comparison between the steps taken by the BJP-led central government against terrorism and the previous Congress government. The Election Commission of India (ECI) had issued a censure to Adityanath over his remark. 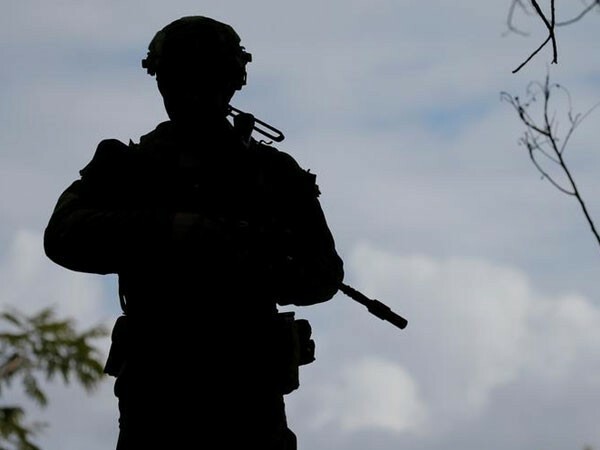 The former military officers regretted that the ECI's censure does not "appear to have resulted in any substantive change of behaviour and practice on the ground". 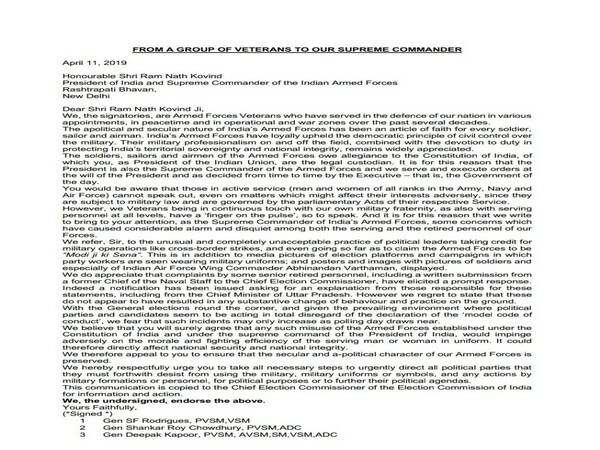 The letter said, "This is in addition to media pictures of election platforms and campaigns in which party workers are seen wearing military uniforms; and posters and images with pictures of soldiers and especially of Indian Air Force Wing Commander Abhinandan Varthaman, displayed." It said that the misuse the armed forces "would impinge adversely on the morale and fighting efficiency of the serving man or woman in uniform".